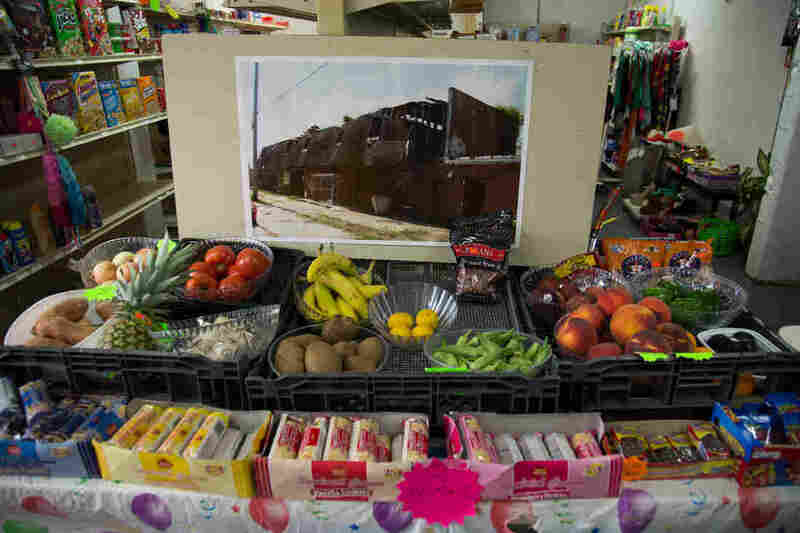 In New Orleans' Hardest-Hit Neighborhood, A Recovery — By Sheer Will Nine years after Hurricane Katrina, the area still had no grocery store. So, using his savings, Burnell Cotlon opened one himself. "If there's a problem," he says, "somebody's got to make a move." 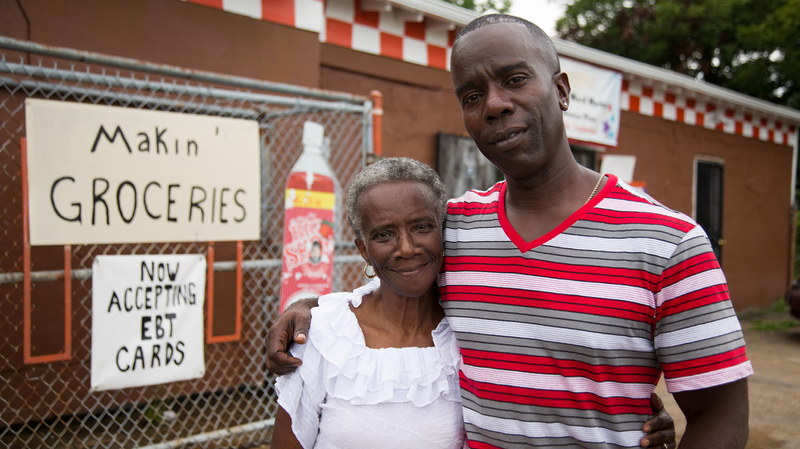 Burnell Cotlon, 48, visited StoryCorps in New Orleans with his mother, Lillie. 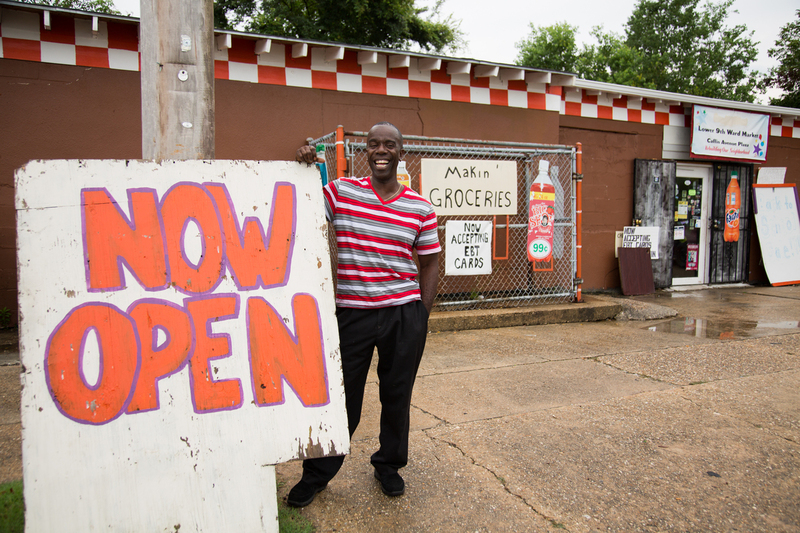 Before he opened his store the area had gone nine years without a grocery store. Ten years ago, when Hurricane Katrina hit New Orleans, it was the city's Lower Ninth Ward that was hit the hardest. "I remember coming back home," Lower Ninth resident Burnell Cotlon told his mother, Lillie, on a recent visit with StoryCorps. "That was the first time I cried." "We lost everything," Lillie says. Recovery was especially slow to come to that part of town. Burnell, a veteran and a father himself, says that for three years he had to live out of a trailer set up by the Federal Emergency Management Agency. Residents in the area went nine years after the storm without a grocery store. "We didn't have no stores, no barbershops, no laundry rooms," Burnell says. "You have to catch three buses to get to a store. And I always was taught if there's a problem, somebody's got to make a move." He decided to open up that grocery store himself. 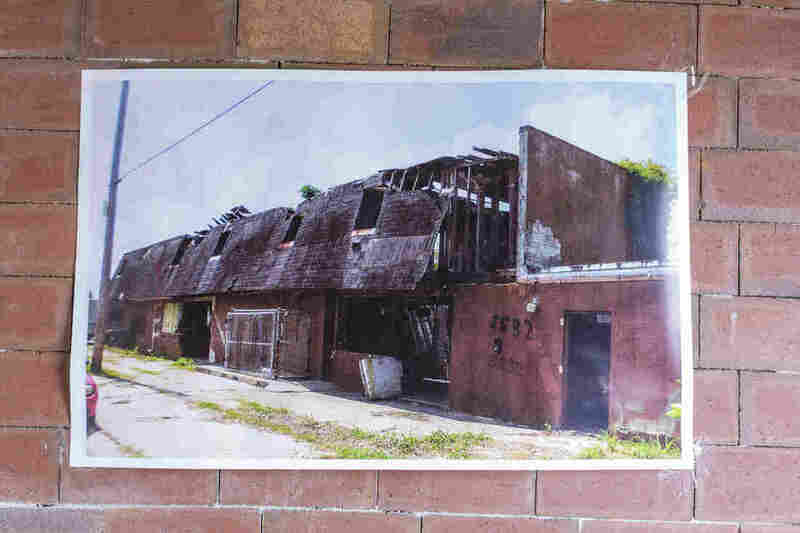 Using money he'd saved up while working at fast-food restaurants and dollar stores, Burnell bought a dilapidated building on an empty block and got to work — all amid a fair bit of skepticism. "I remember when I first bought the building, everybody thought that I was crazy." Even his mother had her doubts. "When I peeked in the door before you started working, I said, 'This is nothing but junk!' I mean, it was trash and debris on the floor that you had to crawl over and — how can he make anything out of this?" she remembers thinking. "But you were one of my very interesting sons, always jumping into things you had no business doing." "Those eight-hour days turned into 14, 15 hours a day," Burnell says. "But what motivated me the most was seeing the people that was walking by with the groceries and seeing them get off the bus with all of those bags. That made me work harder." When the day finally arrived, when the ribbon was cut and Burnell's grocery store finally opened, he says he'll never forget the moment. "The very first customer cried 'cause she said she never thought the Lower Ninth Ward was coming back." "You saw something that I didn't see," Lillie tells her son. "I'm glad you took the chance." Those long days certainly yielded a worthy reward. "Just seeing so many people, the look on their faces, it's a joy," Burnell says. "It's a headache back then but now it's worth it." The plaza in the Lower Ninth now consists of a barbershop and a sweets shop — but there's plenty of work still to be done. And Burnell isn't resting. "If it take me doing it by myself I'm a put one business at a time back into the Lower Ninth Ward," he says. "'Cause it's home." Audio produced for Morning Edition by Liyna Anwar.